33 C o m m e r c i a l T i r e D e a l e r TM w w w . M o d e r n T i r e D e a l e r . c o m I n the last three years the economy has dealt Northwest Tire Inc. a pretty tough hand. Oil prices fell. e Canadian ex- change rate tumbled, and farm com- modity prices dropped. ose are three important pieces to the backbone of the Bismarck, N.D.-based tire business, and especially its commercial business. Yet the 41-year-old tire dealership is thriving, expanding its footprint with new stores and adding locations in existing markets. In the North Dakota communi- ties of Bismarck, Dickinson, Minot and Jamestown the company has opened truck and farm tire stores to accommodate more customers. By taking commercial tire service out of the existing stores in those communities Northwest Tire believes it is opening up more capacity in its retail bays, allowing both sides of the business to grow. "Our commercial business is up," says Kory Grossman, the company's vice president, who has spent the last 25 years working for Northwest Tire. He says the company is growing organically within its existing stores, and also with the addition of new locations. Northwest Tire has 17 stores, and all but one of them is in North Dakota. (ere's a store in Bemidji, Minn., that does a combination of retail and commercial business.) Northwest Tire also has four wholesale locations and two Bandag retread facilities that cap medium truck tires. e company's commercial tire business is diverse. "We've got big national accounts all the way down to the farmer who has one truck," Grossman says. "We don't have the luxury of running only large fleets or only farmers, because they shut down for months." e company needs to retain both kinds of customers. And it has to do that work 365 days a year, no matter the weather. at's a real issue for Grossman, as winter brings cold, wind and snow. In February 2018 the mean temperature in Bismarck was 8.6 degrees Fahrenheit. On the coldest night of this past winter, Jan. 13, the low temperature was -29 degrees F. Grossman says it comes down to the company's employees. "Our staff, that's really the deal breaker. "We have pretty good equipment, but if it's not taken care of, it doesn't matter. We are very proud of our staff and they do many things to plan for weather, especially when doing fleet service, service calls and aer-hours calls." ose preparations are making sure the air lines on the company's service trucks don't freeze and using the correct viscosity index oil for the booms and hydraulic equipment. 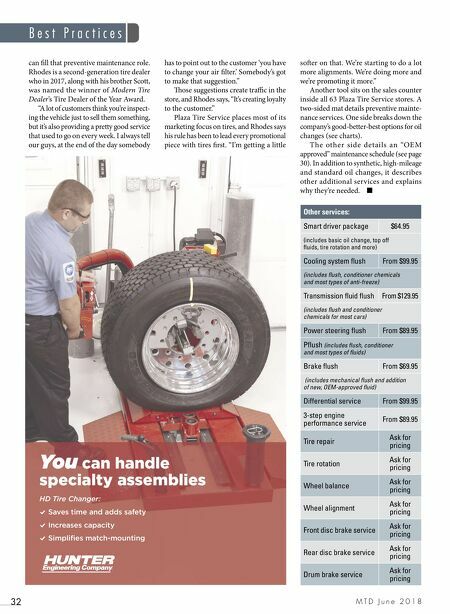 Service truck operators have to be careful with tire lubricants and mounting compounds because they can freeze onto the wheels and tires when mounting tires on site. Air guns get so cold technicians can't touch them without wearing gloves. e winter temperatures are a key driver in the design of Northwest Tire's stores. "In almost all of our places you can get the truck inside, out of the elements," Grossman says. "Our biggest challenge is, 'When is it too cold to go out?'" ere are times the wind is blowing 25 or 30 mph and the temperature is -25 degrees F. Grossman says those super cold snaps don't usually last long, but there might be one week where it's a real safety concern. And that's when a customer's brakes are more likely to freeze. ose calls for help usually don't come in during regular business hours. And it's a rarity when Northwest Tire doesn't take those calls. "We're out there when we shouldn't be out there," Grossman says, referring to the wicked winter weather. "But we've got to take care of the customer." 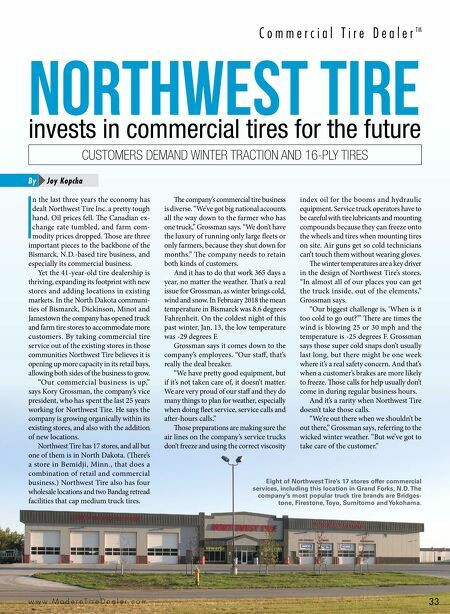 NORTHWEST TIRE invests in commercial tires for the future Joy Kopcha By CUSTOMERS DEMAND WINTER TRACTION AND 16-PLY TIRES Eight of Northwest Tire's 17 stores offer commercial services, including this location in Grand Forks, N.D. The company's most popular truck tire brands are Bridges- tone, Firestone, Toyo, Sumitomo and Yokohama.